A regular breeding resident, migrant, and winter visitant, the Peregrine Falcon was uncommon during the Minnesota Breeding Bird Atlas (MNBBA). The Peregrine Falcon is widely distributed across North America, with its primary breeding distribution in extreme northern regions of Canada, in Alaska, and throughout western North America. The Peregrine Falcon has been introduced in many places, including cities, across the United States and Canada. Populations are widely scattered throughout the species’ breeding range. Assigned a Continental Concern Score of 10/20 by Partners in Flight. Formerly listed as a federal and a Minnesota endangered species. The Peregrine Falcon was federally delisted in 1999 and by the state of Minnesota in 2013. In Minnesota, it is still officially listed as a Special Concern Species and designated a Species in Greatest Conservation Need by the Minnesota Department of Natural Resources. A short- to long-distance migrant that winters along the North American coasts (Pacific, Atlantic, and Gulf); individuals can be found almost anywhere from the United States all the way to South America. The species practices leap-frog migration, with the most northerly populations migrating the farthest, from northern North America to Argentina and Chile in southern South America. Primarily birds, small to large (e.g., waterfowl), occasionally mammals, and rarely amphibians, fish, and insects. Cliffs but more recently tall buildings, bridges, smoke stacks, and other artificial structures. The Peregrine, which means “wanderer,” is worldwide in distribution and found on all of the world’s continents except Antarctica. The species gained great notoriety during the 1960s and 1970s, when its population plunged due to the use of persistent chemicals. It is one of the most-studied bird species, with a bibliography that exceeds 2,000 primary scientific titles (White et al. 2002). Roberts described only a few confirmed nests, ranging widely from near Lutsen in Cook County and Little Marais in Lake County along the North Shore of Lake Superior to Homer in Winona County. All observed nests had eggs, young, or both. Johnson (1982) summarized the nesting of the Peregrine Falcon reported by various authors from the mid-1930s to the 1980s. Besides the nesting records previously reported by Roberts (1932), Johnson included 13 nesting records of the species, ranging from 1939 to 1962. These nesting records included Cook, Goodhue, Lake, Pine, St. Louis, Washington, and Winona Counties. Johnson noted the paucity of observations in the 1960s, but he did mention two summer observations since the 1971 report by Green and Janssen. Both observations were in June 1981, in St. Louis and Nobles Counties. Janssen (1987) reiterated much of what had been previously described by Green and Janssen (1975) and by Johnson (1982). He reported on the reintroduction programs that were initiated in Cook and Wabasha Counties. The first successful reintroduction occurred in 1984 in Wabasha County. That program was initiated in 1982 at Weaver Dunes in Wabasha County by Drs. Patrick Redig and Harrison “Bud” Tordoff, both from the University of Minnesota (Tordoff and Redig 1997, 1999). The first reintroductions were unsuccessful because of predation by owls and raccoons but, as noted, reintroduction was successful in 1984. Later reintroductions were successful at buildings in Minneapolis and Rochester and on cliffs along the North Shore of Lake Superior. These initial humble efforts to reestablish Peregrine Falcon breeding in Minnesota were ultimately highly successful and have resulted in the extensive nesting we see in the state today. As of 1998, Hertzel and Janssen reported confirmed nesting in 11 counties, including Dakota, Hennepin, Itasca, Lake, Olmsted, Ramsey, Sherburne, St. Louis, Washington, Winona, and Wright Counties. The Minnesota Biological Survey recorded 5 breeding season locations during its county surveys, including 1 in central St. Louis County, 1 each on the North Shore in Cook and Lake Counties, and 2 in Cook County on the border with Canada (Minnesota Department of Natural Resources 2017). MNBBA participants reported 132 records for the Peregrine Falcon, primarily distributed on the North Shore of Lake Superior from St. Louis to Cook County and along the Mississippi River from Winona County north all the way to Itasca County (Figure 1). Breeding records were from 1.7% (79/4,742) of the surveyed blocks and from a mere 0.9% (20/2,337) of the priority blocks (Figure 2; Table 1). The general distribution of the many observations corresponded to the species’ historical breeding distribution along the North Shore of Lake Superior and along the Mississippi River, especially in southeastern Minnesota. Nesting was confirmed in 49 blocks in 17 counties. In addition to reports along the North Shore and the Mississippi River, other confirmed nesting included aeries in Cohasset, Itasca County; northern Cook County in the Boundary Waters Canoe Area Wilderness; Cloquet in northern Carlton County; and Mankato, Blue Earth County. Probable nesting was identified in the iron mining region of central St. Louis County, and possible nesting was identified from East Grand Forks, Polk County, and Crow Wing and Morrison Counties in central Minnesota. Scattered observations were also noted from 17 blocks, including blocks not previously mentioned in Aitkin, Brown, Lake of the Woods, and Mille Lacs Counties. The history of the decline in the Peregrine Falcon’s population has been well documented in Minnesota (Coffin and Pfannmuller 1988) and in North America (Evans 1982; White et al. 2002). For instance, Coffin and Pfannmuller summarized that the use of organochlorine pesticides, especially DDT, after World War II caused the pesticides’ accumulation in the food chain and eventual transfer to the Peregrine Falcon via its predation on birds. DDT was linked with eggshell thinning in the Peregrine Falcon and many other species of birds and resulted in poor or complete failure of nesting. In addition, habitat loss and increased human activity contributed to declines. 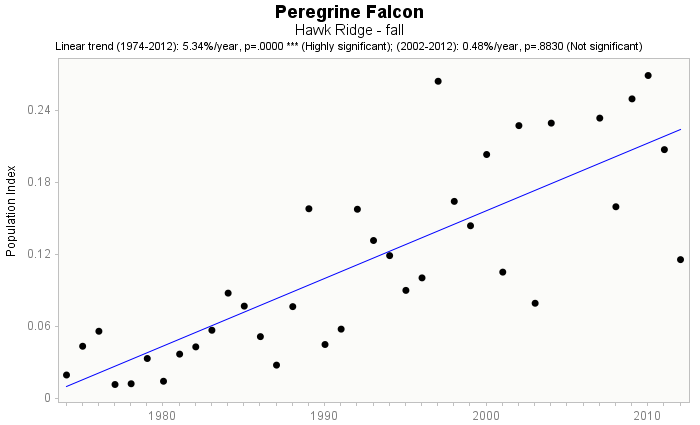 Johnson (1982) highlighted that the Peregrine Falcon had begun declining in the late 1940s and early 1950s throughout the eastern United States; others noted similar declines throughout North America. White et al. (2002) identified the maximum extent of reduction in the species distribution, which occurred from 1972 to 1975. As previously mentioned, Minnesota had an active reintroduction program for Peregrine Falcons as part of the recovery plan for the species in North America. This plan has led to an active and on-going monitoring program and detailed reporting of aeries found in Minnesota (Fallon 2015) as well as in many states in the Midwest (Midwest Peregrine Society 2017). In 2015, Fallon (2015) reported over 50 sites in Minnesota that were occupied by a pair of falcons and additional sites that were occupied by a single bird in residence. In addition, new territories are being discovered each year. Breeding distribution of the Peregrine Falcon in Minnesota based on the Breeding Bird Atlas (2009 – 2013). Summary statistics of observations by breeding status category for the Peregrine Falcon in Minnesota based on all blocks (each 5 km x 5 km) surveyed during the Breeding Bird Atlas (2009-2013). Summary statistics for the Peregrine Falcon observations by breeding status category for all blocks and priority blocks (each 5 km x 5 km) surveyed during the Minnesota Breeding Bird Atlas (2009-2013). The availability of food is also an important factor. The species hunts in open areas such as shorelines, mudflats, and other spaces where birds congregate. Suitable places are found within human-dominated habitats, where pigeons, blackbirds, crows, starlings, shorebirds, or waterfowl often can be found in large groups. An example of an artificial nest site (hack box) of the Peregrine Falcon at Lock and Dam Number 1 in Minneapolis, Minnesota (© Lee A. Pfannmuller). Partners in Flight currently estimates the United States and Canadian breeding population at 40,000 adults (Rosenberg et al. 2016). The Partners in Flight Science Committee (2013) had estimated a global population of 140,000 adults, including the massive area of North America, Europe, and Asia. Environment Canada (2011) estimated a broad range, reflecting the uncertainty in population estimates, at 5,000 to 50,000 adults. Population trends were unreliable for the Peregrine Falcon based on the federal Breeding Bird Survey (BBS) because of the species’ rarity and because the roadside count method was not designed to adequately detect populations of many raptorial species, such as the Peregrine Falcon. The Raptor Population Index 2013 (Brandes et al. 2017; Crewe et al. 2017) was developed to assess population trends for migrating raptors at fall migration count sites, such as those at Hawk Ridge in Duluth. The count trend indicated a highly significant population increase of 5.3% per year from 1974 to 2012 (Figure 4). Partners in Flight also estimated that the Peregrine Falcon population had increased by 105% from 1970 to 2014 (Rosenberg et al. 2016). These increases are also supported by the increase in nesting of the Peregrine Falcon in Minnesota and the upper midwestern United States from no confirmed nesting in the 1970s to more than 50 aeries in Minnesota today (Fallon 2015). Raptor population index for the Peregrine Falcon based on fall migration counts at Hawk Ridge, Duluth, Minnesota (http://rpi-project.org/2013/graphs.php?rsite=288). Because of extremely low populations of the Peregrine Falcon in the 1950s and 1960s, primarily due to DDT and the closely related DDE, the species was listed as federally endangered in 1970. A recovery plan was developed and implemented in the late 1960s. Since then, the species has made a remarkable recovery and is a grand success story in conservation. The species was delisted from the federal endangered species list in 1999. Officially listed as an Endangered Species in Minnesota in 1984 (Coffin and Pfannmuller 1988), it was downgraded to Threatened in 1996 (Minnesota Department of Natural Resources 1995) and to Special Concern in 2013 (Minnesota Department of Natural Resources 2013). It also is designated a Species in Greatest Conservation Need in the state (Minnesota Department of Natural Resources 2015). The latter listing specifies that the species has had a statistically valid decline and limited ability to recover from low reproductive rates. Even though the recovery program has been highly successful, natural reproduction and full recovery of the population in North America still deserves to be closely monitored. Partners in Flight currently estimated a moderate Continental Concern Score of 10/20 in its recent assessment of landbirds in North America (Rosenberg et al. 2016). The Peregrine Falcon’s score was largely based on its relatively small population size in North America. Many issues have been identified to conserve viable populations of the Peregrine Falcon into the future. These include protecting nest sites, providing education to avoid the illegal shooting of the Peregrine Falcon and all raptors, ensuring a suitable supply of birds that the species primarily forages, improving understanding of diseases and parasites, and safe use of pesticides (White et al. 2002). The Peregrine Falcon has had a high profile history in North America. Its continued existence is highly dependent on the extent to which future plans are implemented and on the continued monitoring of its populations. Fortunately, the future of this sleek, swift, and majestic species is substantially improved from the 1960s and 1970s, when nary a Peregrine Falcon could be found in Minnesota. Tordoff, Harrison B., and Patrick T. Redig. 1997. “Midwest Peregrine Falcon Demography, 1982–1995.” Journal of Raptor Research 31: 339–346. Tordoff, Harrison B., and Patrick T. Redig. 1999. “Close Inbreeding in Peregrine Falcons in Midwestern United States.” Journal of Raptor Research 33: 326–328.